Take the Route 22 East jughandle on the left in Bridgewater. Merge onto Route 22 East and make the first right on Chimney Rock Road (right over the railroad tracks). UPS depot will be on your right as you come down to the first traffic light. Go straight at that traffic light, you will be crossing over Route 28. Come to another traffic light. That is East Main Street. Make a left at the light and TD Bank Ballpark is on the right. Ride NJ TRANSIT to Somerset Patriots at Bridgewater And Save $2 On Tickets! The only NJ Transit rail line that serves the Bridgewater Station Stop is the Raritan Valley Line. 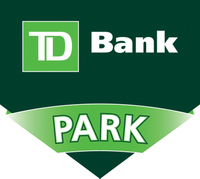 This stop is located within the TD Bank Ballpark Complex.